Another fabulous time at The Great Wolf Lodge was had by all this week, and I'll probably go into more detail on that later. 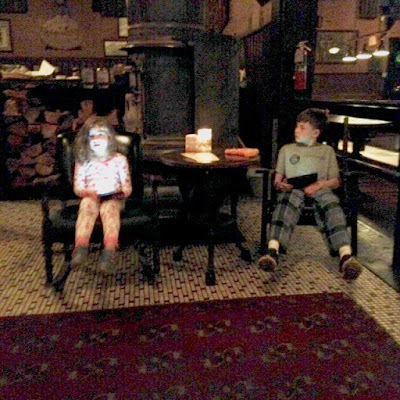 However, I must tell all locals who visit the Lodge to definitely check out McMenamins Olympic Club in Centralia. It's SO worth taking the quick 15 minute drive from the resort for some tasty drinks and the best freaking tater tots. I had a nice little Rye Whiskey Sidecar and my husband got one of their own tasty brews (the Hammerhead Ale). 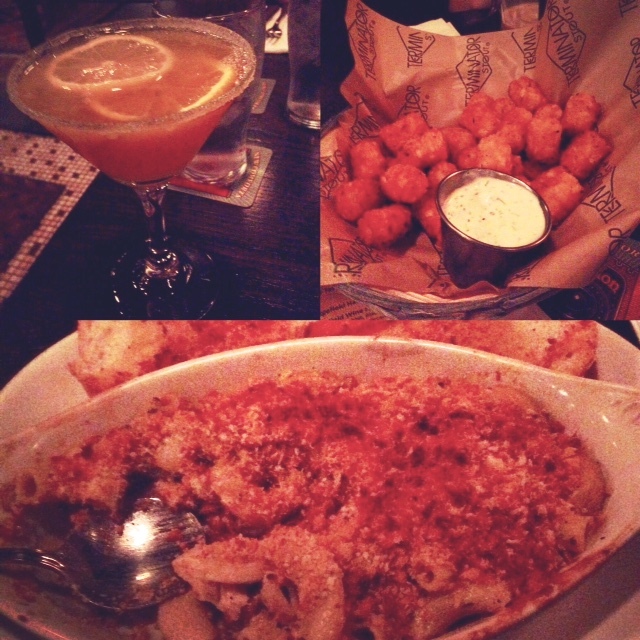 We shared the Cajun Tots and I ordered the baked mac and cheese with Cajun chicken, blue cheese and toasted bread crumbs. I don't usually go for rich cheesy entrees, but I'm glad I splurged! The kids menu also had great choices, even though my kids went for their usual: pizza for the boy child, mac and cheese for my girl. And they were QUALITY. We definitely snuck a few bites. It did feel a little weird bringing them into the restaurant, as it was reminiscent of some of my favorite old Chicago bars! Lots of 'No Minors' signs, but everyone was very welcoming and pointed us in the right direction to the dining room. Plus, the always appreciated crayons and coloring pages were supplied. Since it was a weeknight, it wasn't too busy and the kids poked around a bit. We gave them their tablets after they ate so we could decompress. And we got back to the Lodge right on time for the evening story time and clock tower show. Best decision ever. It seems that everyone in my Facebook feed was visiting the new McMenamins in Bothell on the same night. The grand opening was on Thursday and it's only five minutes away from our house. Hopefully we'll make it there soon!